Some states may be better at identifying babies at risk, Feild said, and in other instances, high-profile news stories about abused children have raised awareness, so more people may be calling local child agencies with concerns about potential maltreatment. Often placing infants with foster families can be hard, because many foster parents work outside the home, which means they need to use daycare, said Irene Clements, executive director of the National Foster Parent Association, a Texas-based nonprofit. That can result in a shortage of foster families willing to take on an infant. Babies who have been exposed to drugs pose even more challenges for foster families. Often they have a host of medical problems, including neurological issues and skin sensitivity, making it all but impossible to cuddle them, Clements said. And it’s tough to find a daycare center that’s able to meet their considerable needs, she said. 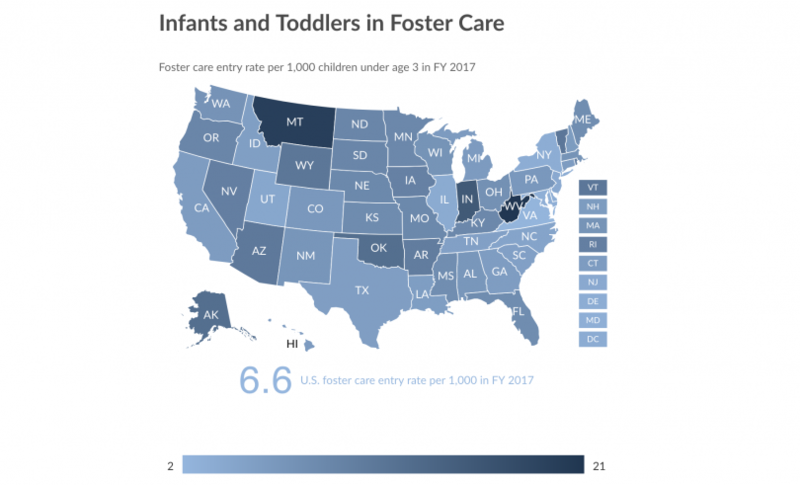 Image by Pew Charitable Trusts: In fiscal year 2017, infants and toddlers under the age of 3 entered foster care at a rate of 6.6 per 1,000, more than twice the 2.8 rate of children ages 4 to 17. Image Source: Child Trends, using data from the U.S. Census Bureau and the Adoption and Foster Care Analysis and Reporting System at the U.S. Children’s Bureau. Teresa Wiltz is a staff writer for the Pew Charitable Trust’s Stateline, where this story first appeared.